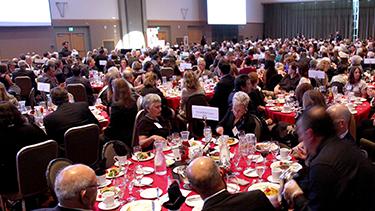 Over 500 guests gathered to celebrate the largest UNM Law School event of the year. 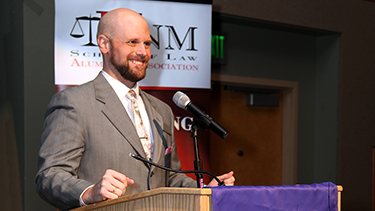 Over 500 enthusiastic guests gathered at the UNM Student Union Building on Friday, October 20 to enjoy the UNM Law School’s largest event of the year. 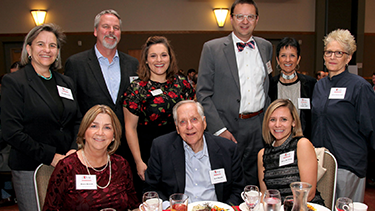 By all counts, the 2017 UNM Law Alumni Association Distinguished Achievement Awards Dinner exceeded goals as well as expectations. The event also demonstrated just how special the UNM Law School and the law community truly are. First goal: honor exceptional members of the legal community in a significant way. Check! The 2017 event paid tribute to Professor Barbara E. Bergman, Director of Advocacy, University of Arizona James E. Rogers College of Law; the Honorable Michael D. Bustamante (Ret. ); Professor James W. Ellis, University Distinguished Professor of Law; and Shammara H. Henderson, who received the new Alumni Promise Award. Videos showcasing each honoree were a highlight of the evening, and there were several standing ovations throughout the evening. Former students and colleagues described each honoree’s outstanding work ethic, transformative contributions to the field of law and to the law school, as well as their service to the community. The 2017 honorees (left to right) Shammara H. Henderson, Professor Barbara E. Bergman, the Honorable Michael D. Bustamante (Ret.) and Professor James W. Ellis with their awards. Second goal: raise money for law school programming and scholarships. Check! The dinner is also a fundraiser, and nearly $100,000 was raised to help fund three full-tuition scholarships and more at the Law School, proving once again how support from the strongly engaged legal community changes lives. Numerous sponsors made this year’s event a very special occasion, and the Law Alumni Association and the law school are very grateful for their generosity. Third goal: ensure that all attendees have a wonderful time. Check! 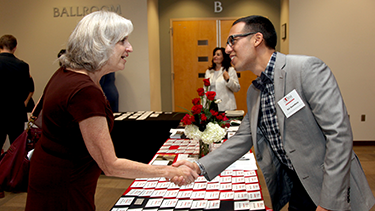 UNM Law School students, including Sal Guardiola (Class of 2018), greeted attendees. “The energy and positivity in the room were palpable,” said Robert Lucero, who chaired the event. “I was so inspired by the honorees and by those who spoke on their behalf. 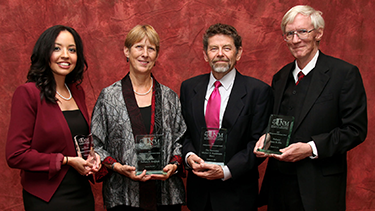 It became even clearer to me that the UNM Law School is truly a special place,” added Phillips. Law Alumni Scholarship recipient Brandon Ilgen (Class of 2019) welcomed attendees. Attendees demonstrated the spirit and vitality between the law school and the Bench and Bar. A few UNM Law School students show their appreciation for supporters of the law school and this event.